Welcome to another planet. 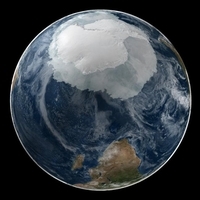 Its name is Antarctica, and it's not so far from where you live. Feel the salty spritz of the sea from the smack of a nearby whale tail, be dwarfed by white mountains and deafened by chattering penguin colonies, sail inside a restless volcano - you'll wonder who the genius was who thought up Antarctica. Best-selling, most comprehensive guide to Antarctica. Great maps and brilliant colour images. Expanded coverage of climate change and responsible travel. Informative wildlife chapter profiling penguins, seals, whales and birds. Coverage Includes: Planning chapters, Southern Ocean, Antarctic Peninsula, Ross Sea, East Antarctica, the South Pole, Understand and Survival chapters. Dieses ReiseHandbuch wendet sich an alle, die mehr über den Kontinent am Südpol erfahren möchten, darunter auch die, die konkret eine Reise in die Antarktis planen. Der erste Buchteil enthält umfassende landeskundliche Informationen zur Antarktis: Entdeckungsgeschichte, Geowissenschaften, Klima, Ozonproblematik, Eis, Forschung, Tourismus, Flora, Fauna u.v.a. werden mit Bildern, Tabellen und Zeichnungen veranschaulicht. Eine realistische Möglichkeit, den entlegenen und extremen Kontinent als "Normalbürger" zu bereisen, stellen organisierte Kreuzfahrten dar. Im zweiten Teil des Buches beschreibt der Autor über 60 Orte in der Antarktis, auf den Südshetland-, Südorkney- und Falklandinseln, in Südgeorgien und Südamerika, die wegen ihrer landschaftlichen Einmaligkeit von den Kreuzfahrtschiffen bevorzugt angelaufen werden oder auf der Anfahrtsroute liegen. Der dritte Teil informiert den Leser in den "Reise-Infos von A bis Z" über alle praktischen Fragen zur Vorbereitung und Durchführung einer Antarktisreise und beendet mit kommentierten Literaturempfehlungen, den gehaltvollen, mit einer Vielzahl von farbigen Abbildungen, hervorragenden Karten und anschaulichen Skizzen ausgestatteten Band. Updated throughout, the 6th edition of Bradt's Antarctica: a Guide to Wildlife is the most practical guide to the flora and fauna available for those "going south". Celebrating the amazing and often unique species of this spectacular environment, the title features chapters on the region's famous whales and penguins, and also on lesser known species such as skuas and sheathbills, with full coverage of plumage and identification. Each chapter is accompanied by vibrant illustrations from Dafila Scott to help bring species to life. In the last 10 years visitors to Antarctica have trebled to 30,000, and there are now 35 tour operators visiting the region. Tony Soper's immaculate and engaging text remains the indispensible choice for the intrepid wildlife enthusiast. Ernest Shackleton sailed to the South Pole as the First World War broke out in Europe, intent on making the first ever trans-Antarctic crossing. South ! is Shackleton's first-hand account of the epic expedition, which he described as 'the last great journey on earth'. During the journey their ship, the Endurance, became trapped by ice and was crushed, forcing the men to survive in and escape from one of the world's most hostile environments. With no hope of resuce, Shackleton and four others set sail in a small open boat on a 600-mile crossing to South Georgia. Shipwrecked on the uninhabited side of the island, they were forced into making the first ever winter crossing of the island, all the time threatened by brutal cold and hunger. South ! made Shackleton's name as an explorer. The dramatic story, one of the most astonishing feats of Polar escapology, remains as enthralling as when it was first published in 1919. Deze landkaart verschijnt in de landkaartenserie van het world mapping project door Reise Know-How. Kenmerkend is de hoogwaardige, duidelijke en moderne kartografische weergave. Afgebeeld zijn reisroutes van historische expedities (bijv. Amundsen, Scott, etc. ), onderzoeksstations, gebiedsaanspraken door diverse staten, kustlijn, penguinbroedgebieden; met een vijftalige legenda (duits, engels, frans, spaans en russisch). Satellietfoto van Antarctica. Een foto van ICESat toont het onregelmatige oppervlak van Antarctica's ijsvelden in verbazingwekkende gedetailleerdheid. De hoogvlakte in het centrum van het continent wordt het Oost Antarctisch Plateau genoemd; het witte gebied rondom het continent is zee-ijs. Deze foto is samengesteld op 23 mei 2003, met toestemming van NASA/Goddard Space Flight Center Scientific Visualization Studio, Canadian Space Agency, RADARSAT International Inc.